Concrete pavers, blue stone and all hardscape surfaces add to the curb appeal and enjoyment of your property and work together to your increase property’s beauty and value. In the past, the hardscape industry has sold concrete pavers and natural stone as an investment that will last a lifetime and it can; with proper maintenance. Typically, routine maintenance of paver surfaces involves removing dirt and leaves by sweeping and occasional rinsing. If heavy oil or grease stains occur, a pressure washer with an appropriate cleaning solution can help. Also, depending on weather exposure, you may need to replenish the sand in the paver joints every 2 or 3 years if it washes away due to erosion. If polymer sand is used at the time of paver installation, joint sand addition may not necessary. This special type of sand contains a polymeric additive that binds and hardens the sand and helps to prevent erosion. Sealing concrete paver surfaces will also help to lock in the sand while protecting the pavers from staining. However, sealing does require periodic reapplication depending on the product used and traffic exposure. Tyler’s Landscaping Service understands this investment you have made in your terrace, sidewalk, driveway, and retaining walls. Whether the project was installed last year or 20 years ago, we can restore the beauty or maintain it, not just remove dirt and reduce accumulation of mildew and mold with a pressure washer. We can go beyond basic maintenance. Restoration involves the revitalization of installed pavers—natural stone and concrete surfaces—through minor repairs, joint stabilization, cleaning, and sealing. In doing so, hardscapes can be restored to “like new” condition. Please take note; attempting to restore pavers without the proper training and equipment can lead to damage or complete destruction of your pavers. Walkways and terraces can settle in spots over time if they aren’t installed properly over a stable subbase. However, they can easily be reset by removing the affected pavers and regrading and re-compacting the subbase. Pavers can also be removed and reinstalled in this manner if utility repairs are required. Step 1: Inspect surface and identify areas in need of stain removal, general cleaning & repair. Step 2: Make necessary repairs to hardscape system. the instructions to perform spot cleaning. Deep set stains may require repeat applications. Step 4: Complete overall surface cleaning following instructions below for sealed and unsealed surfaces. Always do a small test area in an inconspicuous location prior to full scale cleaning. Using a multi-use cleaner, perform overall cleaning on entire hardscape surface then rinse with a garden hose and nozzle or light \ pressure washer. Remove efflorescence if necessary. Assess condition of old sealer by performing water test* to determine if reapplication is necessary. In most cases, it is ideal to remove as much old sealer as possible before application of new sealer. 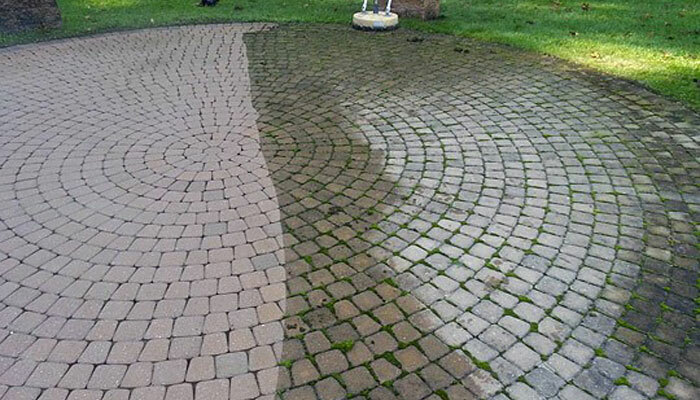 Using a multi-use cleaner, perform overall cleaning on entire hardscape surface then rinse with a standard pressure washer or hot water pressure washer if excessively dirty. Removal efflorescence if necessary. Step 5: If sealing is desired, select and apply sealer following instructions below for sealed and unsealed surfaces allowing surface to completely dry before sealing. Step 2: Re-evaluate surface. If sealing is needed, follow Steps 1 through 5 under Spring Maintenance or Initial Cleaning. Directly above the hardscape surface, drip 3-4 drops of water. If water beads up, sealer is still present. If water spreads, there is little no sealer left on the surface. Perform test in multiple areas. If you have an existing paver patio, driveway, walkway or wall that is uneven, sinking, moving, is creating trip hazards or need sealer application or cleaning / reapplication we can help. Call Tyler’s Landscaping Service at 815-636-8500 for a consultation based on the above guidelines and make your outdoor area safe and beautiful again.